A particle with a diameter larger than 10-5 m will settle within a reasonable time. However, settling time of colloidal particles may reach even years. Filtration, such as rapid sand filtration, may not remove such impurities efficiently, without a preceding coagulation-flocculation treatment. The purpose of the coagulation-flocculation process is to make the small, suspended particles, create flocs and become larger, so they can settle or be removed by filtration. Coagulation is a chemical process in which a chemical compound, a “coagulant”, is added to the water, in order to destabilize the suspended particles and promote creation of flocs. A ‘Stable colloidal particle’ is a colloidal particle that remains as a separate entity in the water, i.e. in a dispersed state. The reason colloidal particles tend to remain in the dispersed state is because their surface is electrically charged, usually with a negative charge. The surface charge forms the ‘electrical double layer’ – positive ions in the water solution get closer to the negatively charged particle and concentrate on it’s surface. The concentration of these counterions reduces with the distance to the particle’s surface. As similar charges repel each other, this assortment of charged particles creates repulsive forces that prevent the them from approaching each other. Compression of the double layer. Compression of the double layer – when electrolytes are introduced. Higher concentration of electrolytes neutralizes more charges, and as a result the thickness of the double electrical layer is reduced, and particles get closer to each other. Electrostatic adsorption – Neutralization of the colloid surface charge. This leads to reduction in the surface potential and destabilization of the colloid. This mechanism usually occurs when inorganic coagulants, such as Alum or Ferrous sulphate are introduced. Adsorption and intraparticle bridging – A bridging molecule (a polymer) attaches a colloid particle to one active site and another colloid particle to another site. This bridging results in a formation of a larger floc. The coagulant could be a natural organic polymer or a synthetic polymer and may or may not carry a charge. Precipitation coagulation – Addition of relatively large doses of coagulants, usually aluminum or iron salts, results in their precipitation, due to solubility limitation. The colloid particles get trapped in the precipitant as it settles down and settle down with it. Coagulants can be classified as organic coagulants and inorganic coagulants. Organic coagulants are cationic polymers with high molecular weight. The major advantage of organic coagulants is that produce much less sludge than inorganic coagulants, due to their higher efficiency. Another advantage is that they do not affect the pH of the treated water. Organic coagulants include polyamines, polyDADMACS, dicyandiamide and melamine formaldehyde. Inorganic coagulants are mostly based on metallic salts, such as iron sulfate and aluminum sulfate. When they are introduced to the water, they react with the alkalinity of the water and hydrate to form a metal hydroxide. Their reaction with water decreases the alkalinity and pH of the water, therefore, supplemental alkalinity may be needed. They produce sludge due to the precipitation of the metal hydroxide and the colloidal matter. Inorganic coagulants also increase the TDS in the water (e.g., as the result of adding of sulfate with Aluminum sulfate). Different metal hydroxides may be formed, depending on the coagulant that is being used, water alkalinity and pH. The type of metal hydroxide that is formed greatly affects the coagulation process. Therefore, each coagulant has an optimal pH range in which it works best. For example, Alum works best at a pH of 5.8-6.5, Aluminium chlorohydrate (ACH) works at a pH range of 6.5-7.5. How to choose a coagulant? To choose the best coagulant, or a mix of coagulants, for the specific water that is to be treated, a jar test must be performed. 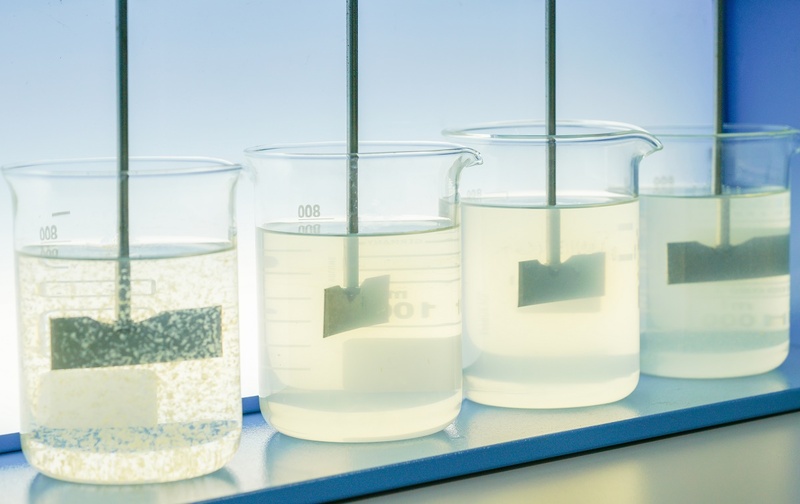 The standard jar test is done in a laboratory, using 6 beakers, where in each beaker different conditions are tested. By modifying the process conditions dosage, pH, coagulation time, settling time, stirring energy for mixing and/or flocculation), the optimal conditions can be determined.